President Lincoln’s patronage problems were compounded by his wife’s relatives – who were anxious for positions which they did not necessarily deserve as a measure of their political loyalty to Mr. Lincoln. An egregious example was the case of Ninian W. Edwards, the husband of Mary Todd Lincoln’s sister. When Mr. Lincoln first moved to Springfield, Edwards was a legislator and lawyer at the pinnacle of the city’s social mountain. But his political and economic condition slipped during the 1850s. He switched to the Democratic Party in 1851 and lived off his position as Superintendent of Public Instruction until the Republicans took control of the governorship in 1857. In the late ‘sixties, Abraham Lincoln and Mary Todd’s wedding day was described to me in detail by Mary Todd Lincoln’s sister, Mrs. Frances Todd Wallace, who lived with her daughter Fanny on the corner of capitol Avenue and Seventh, in Springfield, Illinois. I termed her the saint of the Todd family. I enjoyed my visits with her, talking of olden times in her hospitable home. In 1851 Edwards had switched from the Whig to the Democratic Party, allegedly because he thought it was ticket to election to Congress. Judge David Davis said Lincoln “has talked to me on the subject, and is deeply mortified.”3 Edwards supported Stephen Douglas in both the 1858 senatorial election and the 1860 presidential campaign. Despite their political differences, he repeatedly sought Mr. Lincoln’s assistance He pestered Mr. Lincoln for both a loan and legal advice. He got the loan but not the advice. And he complained that he had been unfairly treated – before defaulting on the loan. Edwards was one of several erstwhile Illinois friends whose official actions caused President Lincoln embarrassment. Just his appointment riled up Mr. Lincoln’s allies in state government. Biographer Paul Simon wrote of their tangled affairs: “Edwards wrote Lincoln for a job shortly after Lincoln’s inauguration as President. The apparent purpose of his letter was for permission to check something out in one of the departments. This request was made in a very vague sort of way, but then he added that he was really in a bad way financially. Lincoln replied with a ‘My dear Sir’ to his brother-in-law and added: ‘It pains me to hear you speak of being ruined in your pecuniary affairs. I still hope you are injured only and not ruined.’ He then suggested that Edwards come to Washington work out arrangements for getting the information he sought. Lincoln chose to ignore temporarily the not-so subtle pleas for the job.”4 Edwards persisted and Mr. Lincoln yielded – naming him as a commissary of subsistence – a position which Republicans charged, allowed him to enrich himself and become a public embarrassment to the President. 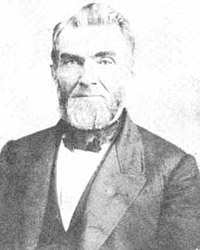 Mr. Lincoln replaced Edwards with George R. Weber and William H. Bailache with James Campbell in late June. 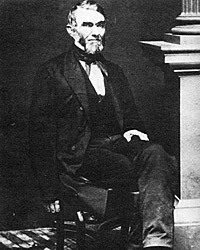 Earlier that month, Edwards wrote President Lincoln a long letter which he pleaded for his job, defended his actions, reviewed a decade of political history and concluded: “If you write that this shall be done I believe it will satisfy all parties At all events can you not try it and allow me to remain here – I am a strong friend of the Union – I would also prefer not to make any Contracts – I assure you again that I shall not be dissatisfied with anything you may think for the best”. You speak of your life long friends in Springfield – desiring a change – I would like to ask you, if when you were a young man I was not your most devoted friend in more ways than one – Let Joshua F Speed, your own conscience recollection, and a letter of yours written to me in 1842 before your marriage answer – Again who was it, when it was thought in 1840 that you would not be nominated for the Legislature publicly stated if any one was to be left out – he (I) should be – Who was your best friend when – Baker, John Hardin & yourself were candidates for nomination to a seat in Congress – Again which of the two Butler or myself was your best friend for years after that – At the last Presidential Election although I differed with you I made several speeches, with the approbation of your best political friends, in order to say what I thought of you – saying that if there was a man living without a fault I believed you were that man – This I can prove. 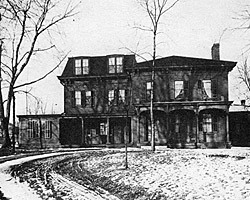 Relationships between the Edwards and Mary Todd Lincoln were rocky throughout her life, but they rescued her from the insane asylum to which she had been committed in 1875 and took her to their home in 1876. Mrs. Lincoln particularly disliked the Edwards’ daughter Julia, who was married to Illinois State Journal editor Edward L. Baker, but liked their son, Edward “Lewis” Baker, Jr.
Douglas L. Wilson and Rodney O. Davis, editor, Herndon’s Informants, p. 623 (William H. Herndon interview with Elizbeth and Ninian W. Edwards, July 27, 1887). Eugenia Jones Hunt, “My Personal Recollections of Abraham and Mary Todd Lincoln”, The Abraham Lincoln Quarterly, March 1945, p. 236-237. Willard L. King, Lincoln’s Manager, David Davis, p. 74. Paul Simon, Lincoln’s Preparation for Greatness: The Illinois Legislative Years, p. 300. Abraham Lincoln Papers at the Library of Congress. Transcribed and Annotated by the Lincoln Studies Center, Knox College. Galesburg, Illinois. (Letter from Ozias M. Hatch, William Butler, and Jesse K. Dubois to Abraham Lincoln, July 22 1861). Abraham Lincoln Papers at the Library of Congress. Transcribed and Annotated by the Lincoln Studies Center, Knox College. Galesburg, Illinois. (Letter from Jesse K. Dubois, William Butler, and Ozias M. Hatch to Abraham Lincoln, October 21, 1861). Michael Burlingame, editor, With Lincoln in the White House: Letters, Memoranda, and Other Writings of John G Nicolay, 1860-1865, p. 61 (Letter to President Lincoln, October 21, 1861). Abraham Lincoln Papers at the Library of Congress. Transcribed and Annotated by the Lincoln Studies Center, Knox College. Galesburg, Illinois. (Letter from Ninian W. Edwards to Abraham Lincoln, October 27, 1861). David Herbert Donald, Lincoln, p. 344. Roy P. Basler, editor, The Collected Works of Abraham Lincoln, Volume VI, p. 275-276 (Letter to Edward L. Baker, June 15, 1863). Abraham Lincoln Papers at the Library of Congress. Transcribed and Annotated by the Lincoln Studies Center, Knox College. Galesburg, Illinois. (Letter from Jesse K. Dubois to Abraham Lincoln, May 23, 1863). Roy P. Basler, editor, The Collected Works of Abraham Lincoln, Volume VI, p. 237 (Letter to Jesse K. Dubois and others, May 29, 1863). Abraham Lincoln Papers at the Library of Congress. Transcribed and Annotated by the Lincoln Studies Center, Knox College. Galesburg, Illinois. (Letter from Ninian W. Edwards to Abraham Lincoln, June 18, 1863).